In looking for something else....I ran into a large box of my built models.......all built before I moved to WV in 2002. Decided they needed to see the light of day......don't think they have ever been shown. First up, as it was pretty clean and intact, a Tamiya Zakspeed Gr5 Ford Capri racer. 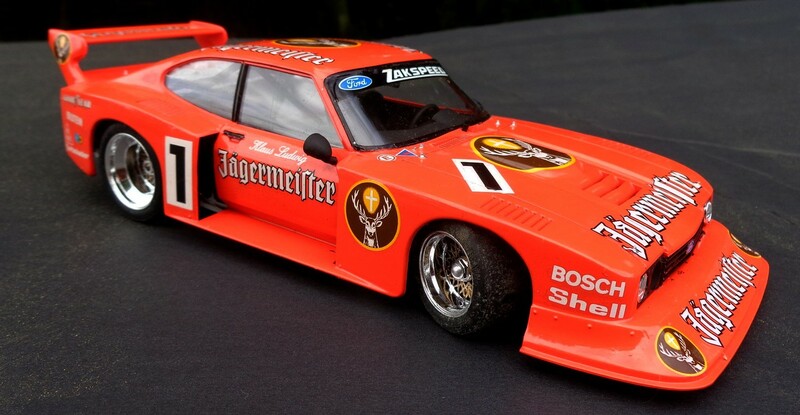 Pretty much box stock with Testors Comp Orange spray (pre Tamiya) Aftermarket decals as I like the Jagermeister cars and kit decals were garbage. That also one of my favorite paint schemes for the Capri. I'm going to do that car and use the Monogram Mustang kit to detail it. You did a very clean job on this puppy Dave.